If you are happy with the area you live in, but your house no longer suits your needs or requires a major upgrade, consider doing a knockdown rebuild instead. People often initiate thoughts about building a new home as their family evolves – parents want additional bedrooms to accommodate the kids, empty-nesters want to downsize with more premium inclusions. Due the limited availability of land on the urban fringe as well as outer suburbs, there is a greater incentive these days for people to knockdown and rebuild. This approach is normally more cost effective than a complicated and lengthy renovation to an older home. You and your family can stay in the same neighbourhood, with all the amenities, schools and friendship network you’re used to. The process of a knockdown rebuild can be quite confronting for most of us who haven’t dealt with councils and builders before, this is a step-by-step guide to what’s involved. You should get some ideas about your block before meeting a builder. 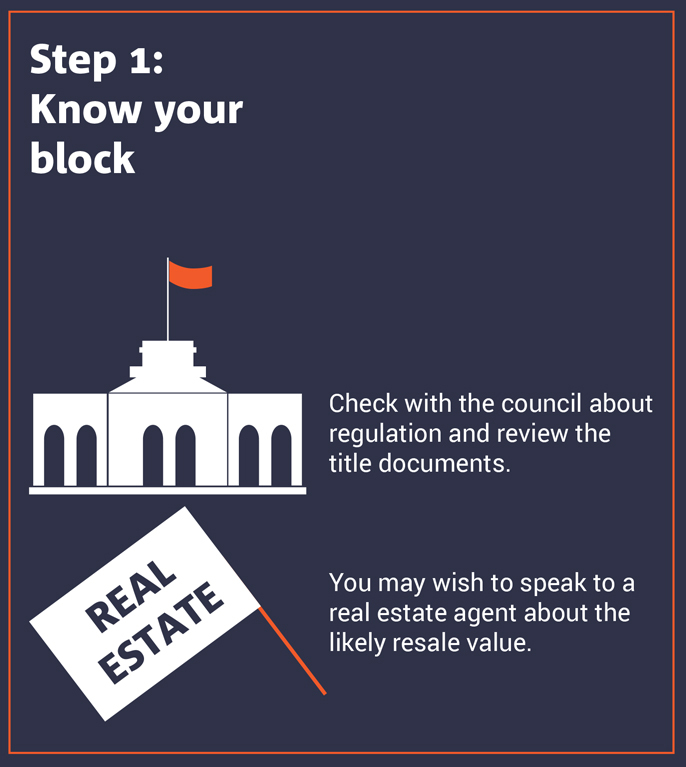 Review the title documents, and check with the council if there are any regulations and issues for your block of land. Building regulations and council requirements may have changed from the time the original house was built. If you are thinking of selling the house after rebuild, you should also speak to a real estate agent about the likely resale value in your area to ensure you don’t over capitalise. 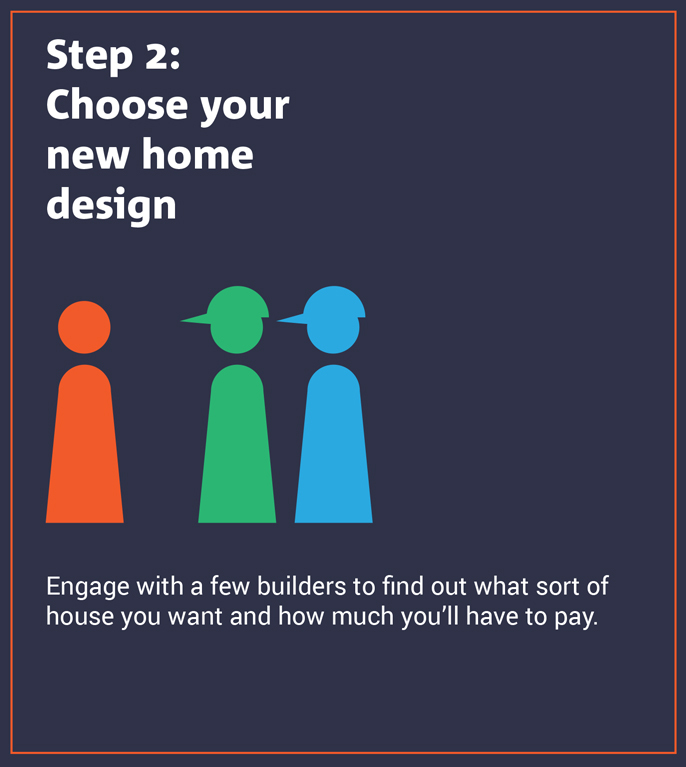 Engage with a few builders to find out what sort of house you want and how much you’ll have to pay. Volume builders are usually the most affordable option, and they will walk you through the entire process. Some of these builders even specialise in knockdown rebuilds. Once you decide to proceed with a builder, they should explain to you the whole progress in detail, especially your responsibilities in obtaining permits and approvals throughout the demolition and construction period. 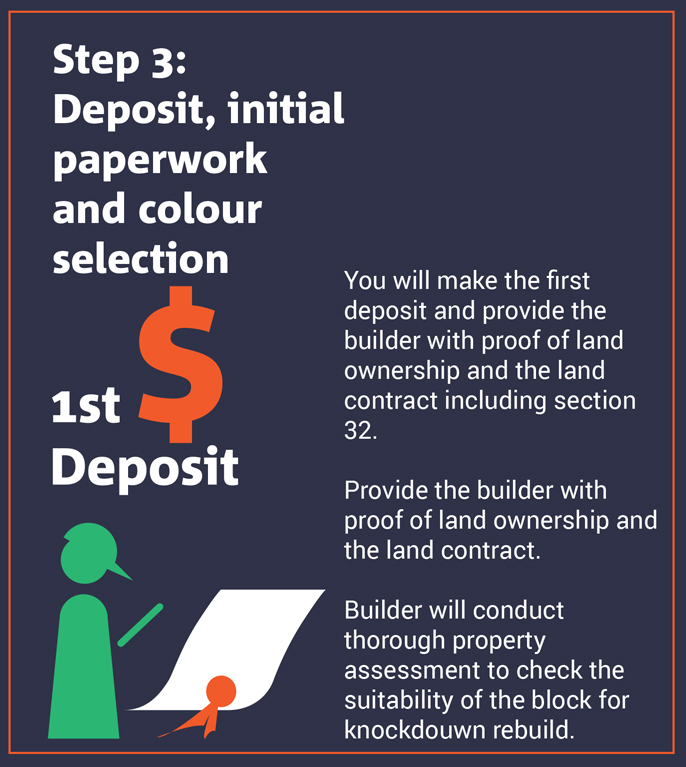 You will make the first deposit and provide the builder with a copy of your Land Title or proof of land ownership and the land contract including section 32. The first deposit is usually to secure the base price, site start allocation and any promotional offers that may be available. The builder will then conduct a thorough property assessment and site inspection to evaluate the suitability of your block for a knockdown rebuild project. The assessment will look at the block depth, frontage, slope, orientation, easements and setbacks, and drainage and power supply, etc. If the block is deemed unfavourable, a full deposit refund may be provided. The builder will proceed with doing soil report, site survey and other council requirements. Meanwhile, you will be referred to the design consultants to make your colour selections. The builder will present you with the new home tender, which covers site related costs, preliminary site plan, selected variations, facade and colour selections. No further structural changes are allowed once you sign your tender (without incurring variation costs). 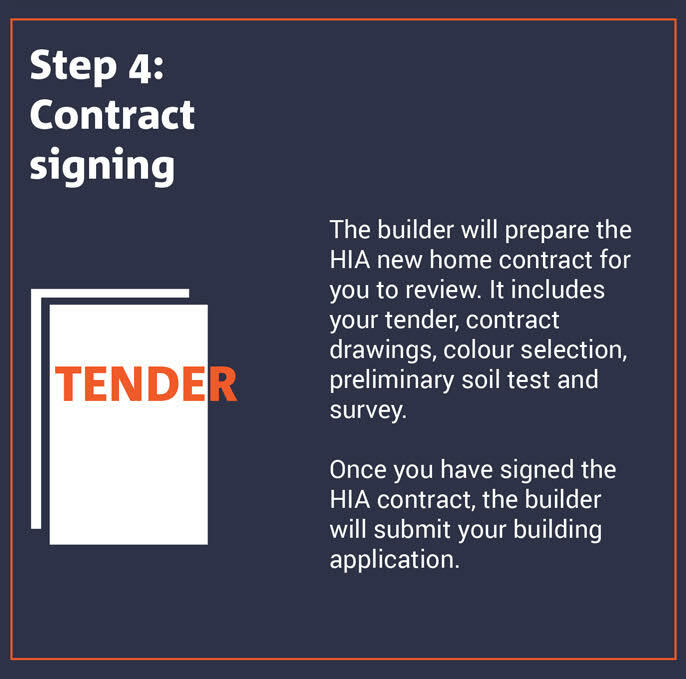 The builder will prepare the HIA new home contract for you to review, which includes your tender, contract drawings, colour selection, preliminary soil test and survey. You will need to pass this on to your lender to prepare for your progress payments. 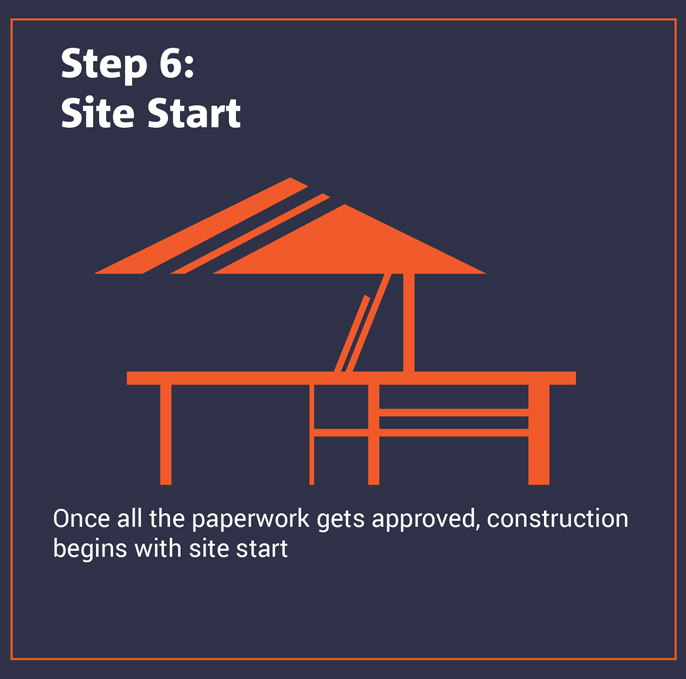 Once you have signed the HIA contract, the builder will submit your building application. Upon completion, the builder will order the second soil test, site survey, re-establishment survey and final slab design. 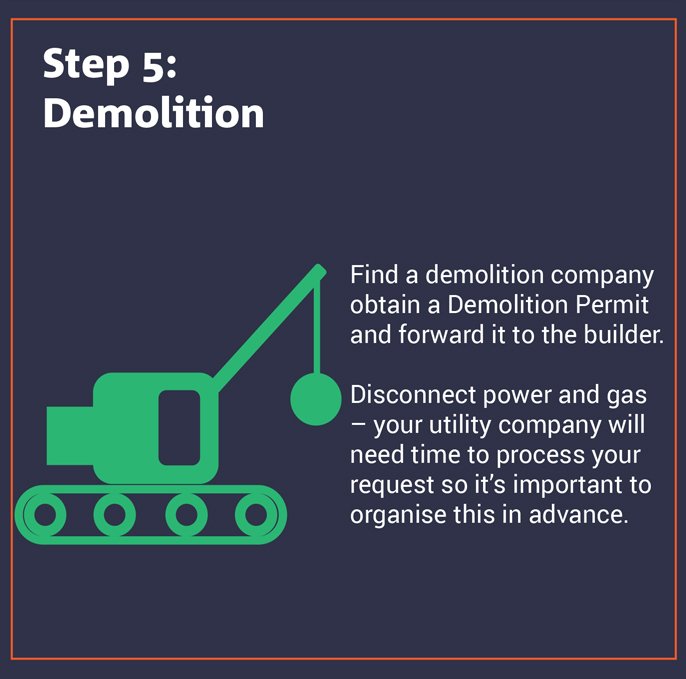 Additional findings may be found after demolition, so the builder will finalise your construction plan and make necessary adjustments to your site costs. Once all the paperwork gets approved, construction begins with site start. Learn more about the later building stages here. Not 100% on a knockdown, maybe consider a renovation instead?